Yunohana Variations is the second tour in a series of live shows commisioned by OUTLANDS, the new national experimental touring network. This tour is produced by Supersonic Festival Birmingham, and will be arriving in Plymouth at KARST on 4th July. 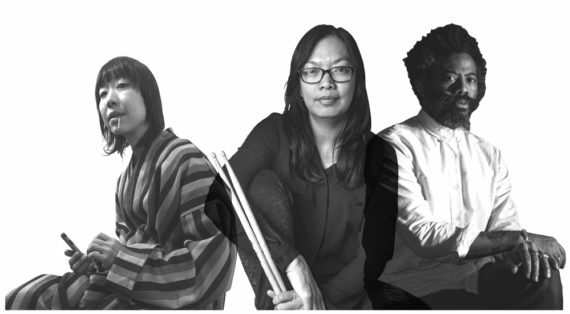 Improvisational luminaries YoshimiOand Robert Aiki Aubrey Lowe will be performing together across the United Kingdom for the first time. Yunohana Variations will be supported by local collective Bizarre Rituals. A perfect evening for lovers of both jazz and performance art. Though the trio have never performed live in the UK together before, they have collaborated to record an album, Flowers Of Sulphur, which was released on Thrill Jockey in February this year. Find out more about the album here. performances in New York City, late in 2015. Bizarre Rituals are a collective of artists, musicians, DJs and VJs who are based within or around Devon. Together they throw parties; create EPs, albums, film soundtracks and mixtapes, and do shows on local FM arts and community radio station Soundart Radio, which is transmitted out of an oak tree. This performance is commissioned by OUTLANDS; the new national experimental music touring network and is supported by Arts Council England and Esmée Fairbairn Foundation.